Hello and Welcome to my Kids Club, I started it in 2014 when my daughter was 4yrs old, I came to the realisation that I needed more easy, fun, creative and educational things to do at home. I don't mind her using tech every now and again but I'm not one for her to be constantly on her iPad or glued to the TV. I would much rather see her playing a game, getting outside or building something. I live in the U.K where the weather is mostly grey and miserable, so being stuck indoors you either get creative or you spend a small fortune at indoor play centres. I know which one I would rather choose. So how does this Kids Club work? It's all FREE! Yes straight from the start of this idea I knew I didn't want to charge for this, it does take a lot of my time up but my daughter loves it and I now get great feedback from other parents, restaurants, teachers and even other entertainers use some of the game ideas in their parties. So I feel like this Kids Club is doing a really good thing. Every Month I pick a theme to explore, now if you have any ideas for themes that I haven't done yet then just post them in the comments section below or get in touch through social media, I would love to hear from you. Every week I post a new game/craft/idea sticking to the month's theme. keep scrolling down and you'll find a grid of some of my most recent posts, thats a great place to start. 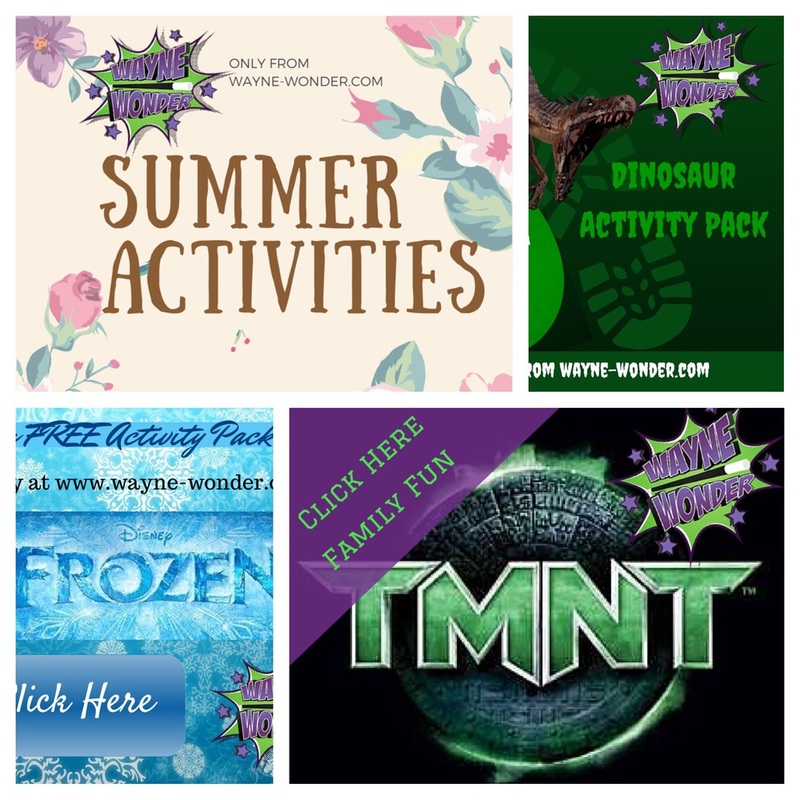 To get you started I have included below some of my favourite topics that I have covered remember there is so much more to explore and if you share a picture on my Facebook page of your family enjoying one of the activities then I'll send you a goodie bag full of Wayne Wonder Prizes. Pizza box present and a ton of other activities. Here's the You Tube channel I appeared on with my Frozen Treasure Hunt game. That's it, just a quick overview of how the Kids Club works and to get you started exploring this blog. I also offer a direct to your inbox service during the school holidays. Again it's all free so sign up below with your e-mail address, I don't sell or share e-mail address's onto any third parties. I will then send you a great idea for every week of the summer holiday's. Remember I only pick ideas that are easy, fun, creative and inexpensive to try at home. Sign up with your email address to receive simple fun and creative ideas to try at home during the school holiday's. We respect your privacy and never share your details onto any third parties. This months activity pack is all about Frozen Fun! I know Frozen has just been huge, I've never seen a film have such a huge reaction before. I have a feeling that it's going to get really big again around christmas too because by then it will be showing on TV, we may have some snow and the kids will be getting their Elsa/Anna dresses or the DVD itself for pressies. So here are some games you can use on rainy days or wait for christmas and try them when you're with the extended family. So this is like the old game stuck in the mud only way more crazy and messy, just the way I like things! When you get tagged you have to freeze until someone can come and un-freeze you. I play it like this - Pick someone to be Elsa, Elsa gets the can of silly string. Pick another person to be Anna/Kristoff, this person will un freeze the frozen stuck people. If the Silly String gets you, you're frozen until Anna/Kristoff tags you. If "Elsa" manages to freeze everybody then game over (it's almost impossible to freeze everybody) Make sure you switch the roles around, so lots of people get a turn at being Elsa and/or Anna/Kristoff. Im going to try this at my shows soon. Click the pic below for an Amazon link to buy silly string. Disclaimer - this is a messy game! although I have never had a problem with silly string indoors I take no responsibility for any stains, play it out in the garden on a snowy day for the best effect. These would be great as a homemade Christmas decoration or just a rainy day activity, click the button for the free download. Here's a free PDF to build your own Olaf, have fun with this and maybe give a little sweet to the craziest looking Olaf. Can you escape the Frozen Maze? Here's another free PDF bit of fun great to take with you if you're going out to dinner or something. I always like to finish these activity packs with something really good, so here it is a custom made Frozen treasure hunt. What you'll need first is something to give as a prize. We use my daughters favourite ice lollies hidden in the freezer. So all the clues led her round the house and back to our freezer. I tried this with my 4yr old daughter and 11yr old sister, it went down a storm. You will need some knowledge of the song lyrics from the film but Im guessing most of you know them by now. Start them with one clue which takes them from one place and then another and then another until they find the prize. Great fun and works brilliantly indoors! As always I would love to hear how you got on with any of these ideas. I would love to see some crazy silly string pictures too! The best posts on my Facebook page wins Wayne Wonder Prizes! Click the Facebook button below.